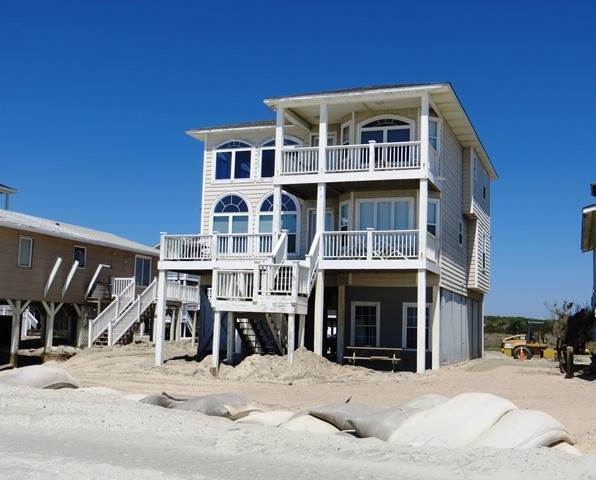 Oceanfront 5 bedroom, 4 bath home on the eastern point of the island. Amazing views of the Atlantic Ocean and Inlet! Open living room with wood floors throughout first floor. Three upstairs bedrooms are carpeted. Central heating and air with ceiling fans in all rooms. Well-equipped kitchen, bright and open with cathedral ceilings. First floor has two bedrooms, one shares hall bathroom and the Queen bedroom with own bath. Upstairs: three bedrooms, one jack 'n jill bathroom and the King master has ensuite bathroom. Will accommodate 2 families comfortably. Great upstairs deck to enjoy the views. Decks off both levels of home to take in the sweeping views of the sea. Convenient entrance to home through single garage. There is a storage area on ground floor for beach equipment.Charcoal grill. Wireless internet access. Sleeps 10. Bedding: Up: K, Q, 2T. Down: Q, Q.